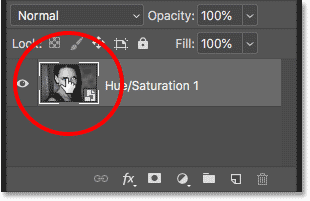 Learn the best way to merge layers in Photoshop by merging them as editable smart objects, and how smart objects make it easy to work with merged layers non-destructively! 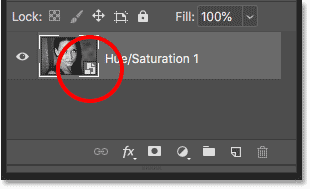 A popular way to work non-destructively in Photoshop is to merge our existing layers onto a new layer above them. By merging layers onto a separate layer, we can apply sharpening or make other changes to the entire image, without the need to flatten the image and throw all of our existing layers away. But even merging layers onto a new layer still isn't the best way to work. Any time we need to make changes to the underlying layers, we need to delete the merged copy, make our changes, and then merge the layers again. A better way is to merge our layers as a smart object. That way, if we need to make a change, we can simply edit the contents of the smart object, save the change, and then have our changes instantly appear in the document. And, since we're working with smart objects, any filters we apply will be added as smart filters, which means we can sharpen the image or make other changes non-destructively. Let's see how it works. I'll be using Photoshop CC but everything is fully compatible with Photoshop CS6. Let's get started! 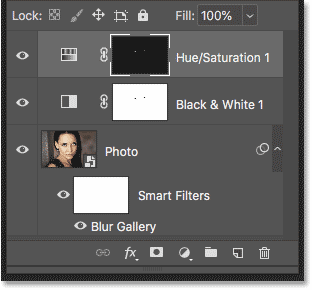 The image open in Photoshop. Photo credit: Adobe Stock. The layers used to create the effect. All three layers have been merged onto a fourth layer. Going to Filter > Sharpen > Smart Sharpen. Applying sharpening to the merged layer. The image after applying Smart Sharpen to the merged layer. But here's the problem we run into. 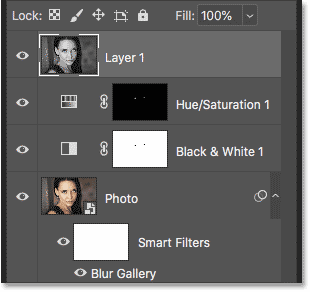 Merging the layers onto a new layer made it easy to sharpen the image. But what if I need to make a change at this point to the effect? 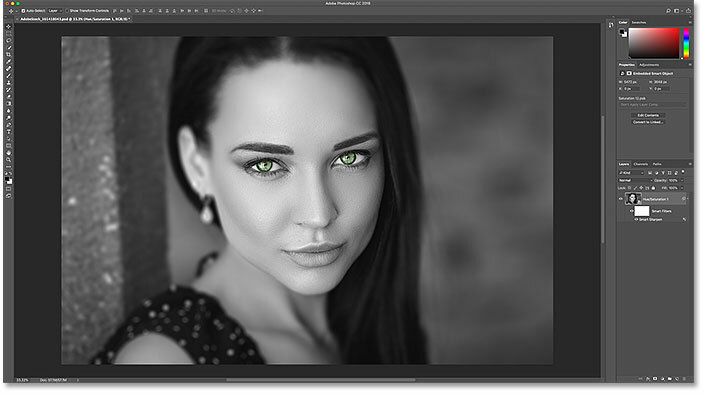 Maybe I want to adjust the blur amount, or remove the Black & White adjustment layer, or even change her eye color. To make any of these changes, I would first need to delete my merged layer. And since I've already applied sharpening to the layer, I would lose my sharpening effect. Once I've made my changes, I would then need to merge the layers again onto another new layer above them, and then reapply my sharpening. And, if I decided to make another change at that point, I'd again have to delete my merged layer and redo all of the steps. A better way to merge layers is to merge them as a smart object. Smart objects are entirely non-destructive, so we can make any changes we need, whenever we need, without having to delete any merged copies, and the changes will instantly appear in the document. 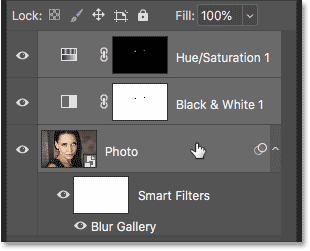 And, when we sharpen the image, or apply any of Photoshop's other filters to the smart object, the filters will be added as smart filters, which means they remain fully editable! All three layers have been merged into a smart object. The smart object opens in its own document. None of the original layers have been lost. 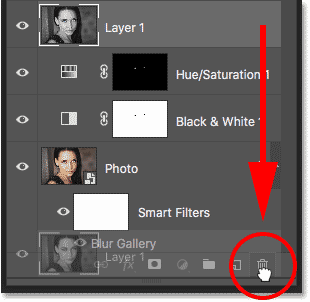 Clicking the Black & White adjustment layer's visibility icon. Turning off the adjustment layer restored the original color. 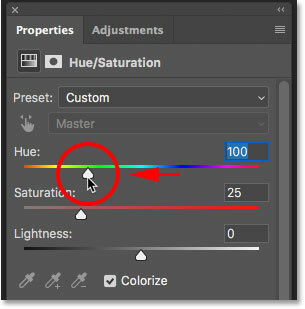 Clicking the Hue/Saturation adjustment layer to select it. 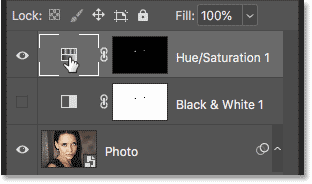 Changing the eye color with the Hue slider. The effect after changing the eye color. The smart object updates with the changes. Going again to Filter > Sharpen > Smart Sharpen. Applying sharpening to the smart object. The image after applying Smart Sharpen to the smart object. 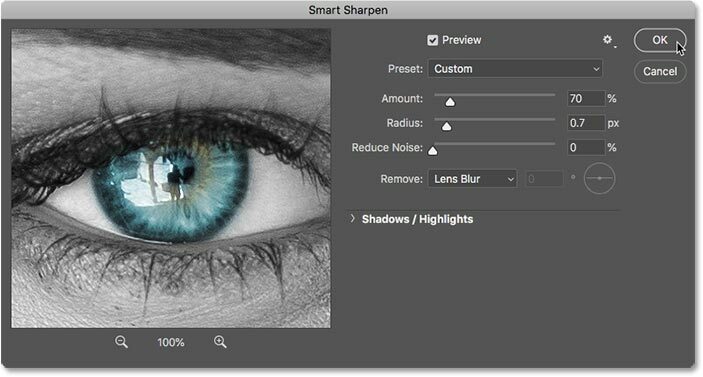 Photoshop converted Smart Sharpen into a smart filter. Just like smart objects, smart filters are non-destructive. 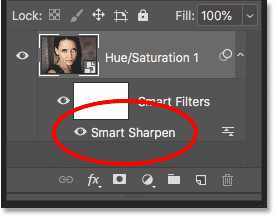 If you need to edit the sharpening amount, you can just double-click on the name "Smart Sharpen" to reopen its dialog box and make your changes. And, because the sharpening is being applied directly to the smart object itself, not to the layers inside it, it will remain applied even if you reopen the smart object and make further changes. 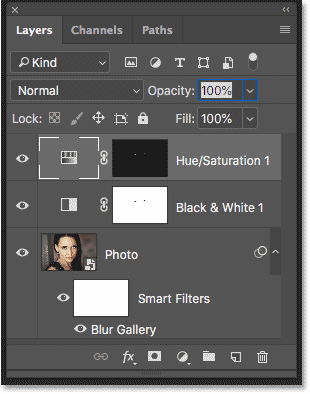 Turning the Black & White adjustment layer back on in the Layers panel. The image is back to black and white. The smart object again updates. 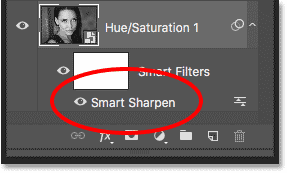 The sharpening filter remain even after editing the smart object. And there we have it! 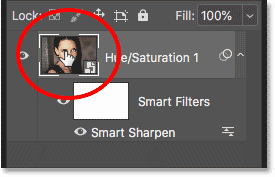 That's how, and why, to merge layers as smart objects in Photoshop! For more on smart objects, check out our tutorials on how to create smart objects, how to edit smart objects, how to scale and resize images without losing quality, and even how to warp and distort text using smart objects! And don't forget, all of our Photoshop tutorials are available to download as PDFs!